Synopsis: YOU CAN BE A VII. IF YOU GIVE UP EVERYTHING. 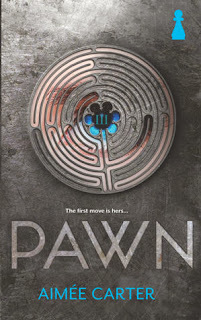 I love Aimee Carter's Goddess Test series so I was super excited to read Pawn. I know a lot of people are burnt out on dystopian but I think Pawn has elements that are different enough to entice even the most cynical of dystopian readers. The world that Carter has created is so rich and detailed. I really liked getting to know the world as Kitty got to know and understand the intimate details of how it is run. Every good dystopian novel needs an evil leader and Pawn definitely has its fair share of corrupt leadership. I was severely creeped out by some of the things the Harts did. I never knew who to trust while I was reading Pawn. There were so many twists and turns to the plot that I was completely surprised by some of the events that transpired. While I really liked Kitty and thought she was a strong but flawed protagonist, I think the secondary characters really shone. Whether it was one of the scheming Harts or Kitty's boyfriend Benji they all added so much variety and spice to the plot! Pawn is one of the best dystopian books I have read in a while. It was unexpected, creepy, and even had a little teeny bit of romance thrown in. I cannot wait for the next book to see what happens to Kitty and the Harts! Definitely pick this one up today! Pawn sounds amazing! I love dystopian books, and I haven't read anything by this author yet. I have added this one to my list! Thanks for sharing!